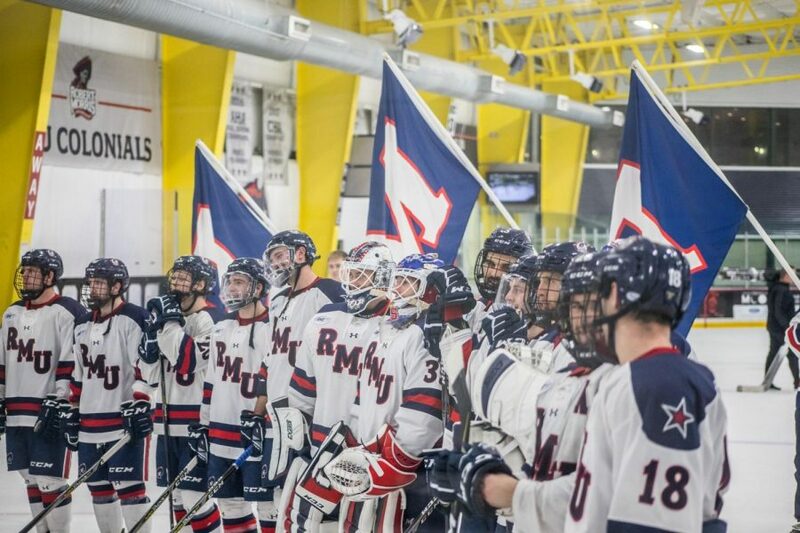 PITTSBURGH — After losing their last three games, and seven of their last nine, the Robert Morris men’s hockey team (9-16-1, 8-11-1 AHA) is looking to get back on track as they face Sacred Heart (8-13-3, 7-9-2 AHA) this weekend. RMU Sentry Media had the opportunity to head to practice to speak with head coach Derek Schooley about the upcoming game. “We’ve got to be engaged positively, you can’t look in the past; you have to look in the future… looking into the future, we’ve had good success against Sacred Heart in the past, but their a good hockey team that we split against earlier in the year,” said Schooley. The Colonials play against Sacred Heart this weekend, with the first game on Friday at 7:05 p.m, and the second game on Saturday, with puck drop at 4:05 p.m. Both games will be at Colonials Arena.